Note: With grateful thanks to all the people from around the world who contacted me with information for this page. Please click here to view a special "Happy Birthday Maestro" slideshow. Lebrecht's hatred for the twentieth century's key conducting figure is by now well-known, and is almost as recurrent a theme in his journalistic hack-work as the prediction of classical music's imminent collapse. 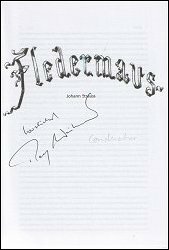 I first came across Lebrecht in 1990 at a public lecture he gave in London's Wiener Library, in which he set out to demolish the significance of not only Herbert von Karajan but also Wilhelm Furtwängler. I subsequently sent Lebrecht a list of the factual errors which largely invalidated his monstrous argument that both conductors had been official representatives of the National Socialists. The current article again illustrates Lebrecht’s disregard for factual accuracy, reducing his argument to the rantings of an envy-ridden obsessive. 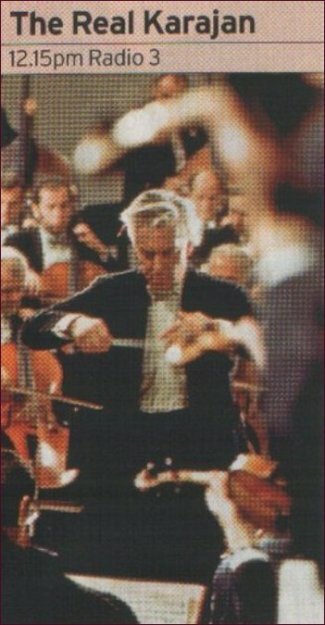 Just to cite a couple of the incorrect assertions, Karajan was not “booted out” of the Philharmonia, nor did he exclude Bernstein, Solti, Harnoncourt and Barenboim from conducting concerts with the Berliner Philharmoniker. 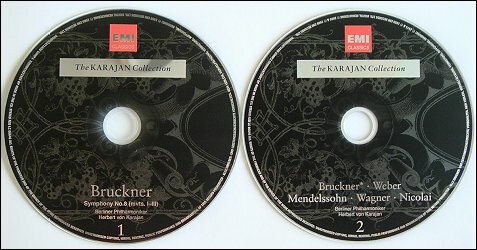 And on the subject of a £200 million fortune, is Lebrecht aware of the vast amount of Karajan’s money which was ploughed back into the record industry for purposes of technological research? 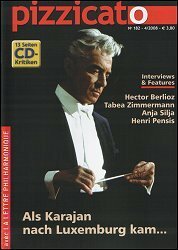 Anyone who has actually interviewed the current holder of the Berlin conducting post would have learned that Simon Rattle could not be further from claiming Karajan as a mentor! 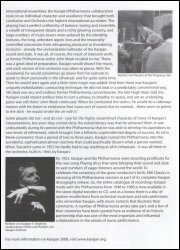 One wonders if Lebrecht’s condemnation would be so harsh if Karajan had been Jewish? Note: Please click here to view Norman Lebrecht's highly contentious article. Note: This is a revised and enlarged edition of the book first published in 1975. It includes a complete Discography and a Videography. 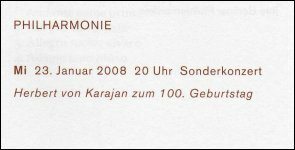 Note: According to the Eliette and Herbert von Karajan Institute there are currently (May 2008) no plans of translating Eliette von Karajan's book into English. Note: This is a reprint of the paperback version of the book first published in 1998. Note: The book comes with two EMI CDs including the 1957 B.P.O. recording of Bruckner’s Eighth Symphony. Note: This is a paperback version of the book first published in 2006.
" Das Wunder Karajan "
BBC Radio 4's “Archive Hour” programme devoted to Karajan. The presenter is Mark Lawson with a contribution from Richard Osborne. The producer is Simon Elmes. 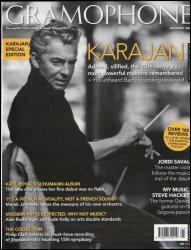 BBC Radio 3 "The Real Karajan" A 45-minute documentary presented by James Jolly. 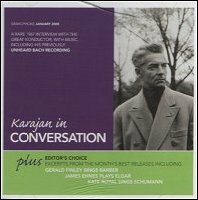 Earlier, at 10.15 am, “CD Review” has a 90 minute section entitled "Herbert von Karajan on Disc" where listeners suggest their favourite recordings. BBC Radio 3 "Afternoon on 3: Maestro-Herbert von Karajan and Friends"
Including rare radio archive recordings of Karajan conducting the Berlin Philharmonic, the Vienna Symphony and Philharmonic Orchestras, and the Philharmonia Orchestra. 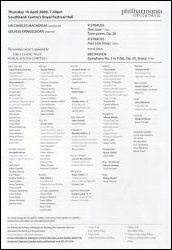 Plus recent concert performances by some of today's leading conductors - especially those associated with the Berlin Philharmonic and with the BBC orchestras. BBC Radio 3 "The Classical Collection" James Jolly plays many of the recordings heard in "The Real Karajan". With thanks to Richard Osborne for providing me with the above information. Classic FM say that some evening concerts are in the process of being planned at the moment. See their website for more information when it becomes available. 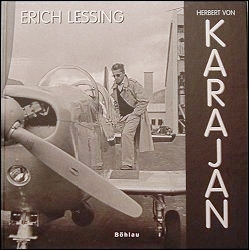 From 7,00 to 24,00 - broadcasting only programmes with and dedicated to Karajan. From 8,00 to 24,00 - devotes the evening to Karajan and opera. Contributors include Emil Tchakarov, Anna Tomowa-Sintova and other Bulgarian singers with whom he worked as well as Karajan himself. which includes Beethoven Symphony No 7, Violin Concerto and Coriolan Overture from Lucerne 27th August 1955. My name is Bernard Clarke, I am a writer and broadcaster with RTÉ lyric fm here in Ireland. 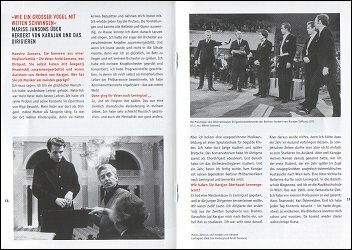 I am preparing a two-part, two-hour special on Karajan for broadcast on Saturday April 19th and Saturday April 26th. I have already appeared on the Arts Show on RTÉ Radio 1 introducing beginners to Karajan's great recorded legacy. I have been informed that 3-Sat are having a Brahms night on 20-21st March with "Der Rosenkavalier" on 5th April. They say further details can be found on their website three weeks in advance that time. I have been informed that ZDF filmed the Vienna concert of 28th January 2008 and it will probably be shown on Arte on 5th April. They also say that they have other HVK programmes planned around that time. "All about Karajan: The Person and his Music on the Centenary of His Birth"
To commemorate the 100th anniversary of the birth of Herbert von Karajan, BS-hi will devote a total of 11 hours to the maestro in a three-part special on April 5. 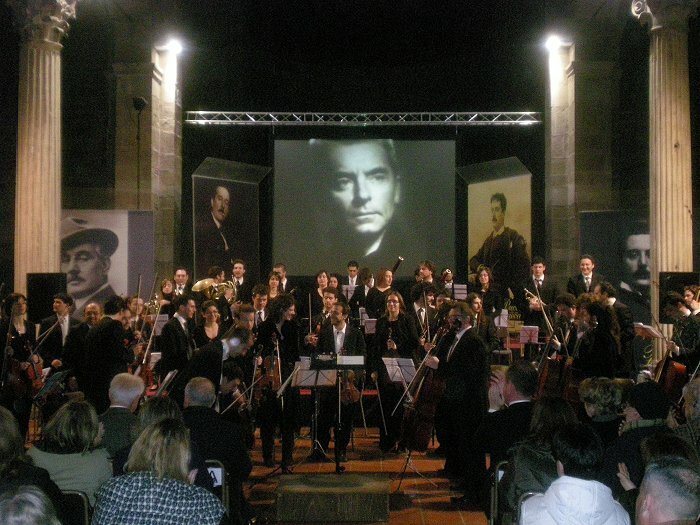 The program will include concerts converted to the Hi-Vision format from 35-mm film for the occasion and also documentary films that vividly depict Karajan’s personality. The guests are actor Koji Ishizaka and music critic, Kyoichi Kuroda, a great admirer of Karajan’s work. 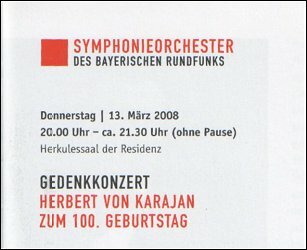 Also, I have been informed that NHK filmed the second part of the Berlin concert of 23rd January 2008. 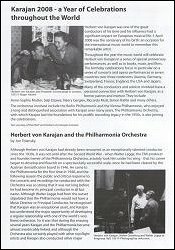 There will be a programme on Karajan for National Public Radio in the USA with a contribution from Richard Osborne. More details to follow. The Austrian Mint are to issue a 5,00 Euro commemorative coin. 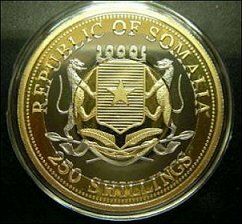 The following commemorative coin has been issued in the name of the Republic of Somalia. "In memory of Herbert von Karajan's first concert as a conductor on 22nd January 1929"
"In memory of Herbert von Karajan on the occasion of his 100th Birthday"
Note: Filmed by German television (ZDF) probably to be shown on Arte on 5th April. 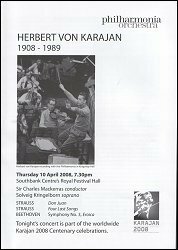 "Commemorating the 100th Anniversary of the Birth of Herbert von Karajan"
"Memorial Concert: Herbert von Karajan’s 100th Birthday Anniversary"
These opera performances are part of the worldwide Herbert von Karajan Centenary 2008 celebrations. Strauss Johann Jnr "Die Fledermaus"
This concert is part of the worldwide Herbert von Karajan Centenary 2008 celebrations. "Salzburg Festival celebrates Herbert von Karajan"
I have been contacted by the artist Martin Baker with regard to a limited edition print of his 1972 drawing of Herbert von Karajan. 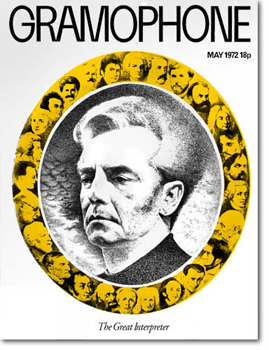 For the Karajan/BPO Royal Festival Hall concerts in 1972 he was commissioned to draw the conductor for the DG Gramophone cover of that month. This unique limited edition portrait of the conductor Herbert von Karajan is published to commemorate the centenary of his birth in 1908. Deutsche Grammophon commissioned the original drawing by Martin Baker for the distinguished Austrian conductor’s concerts with the Berlin Philharmonic Orchestra at the Royal Festival Hall, London in 1972. It was reproduced on the cover of Britain’s prestigious classical record magazine, Gramophone, in May of that year. The composers in the oval surround are those whose music von Karajan frequently performed during this period. This edition is limited to 300 copies signed by the artist. It is reproduced in facsimile of the original pen and ink drawing and is printed upon 300gsm fine art paper, 355mm x 305mm (14” x 12”); image size 230mm x 205mm (9”x8”). Throughout the 1970-80s the artist, Martin Baker, drew many of the world’s greatest composers and musicians for Deutsche Grammophon, the BBC's Radio Times and Glyndebourne Festival Opera. For further details please visit www.musick.it where you will find the complete official programme of the Easter festival in a window on the left side. 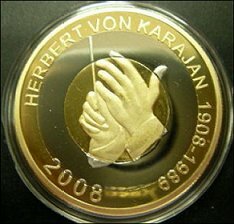 "All the members of the Karajan "club" (If I am allowed to call it so...) are invited as our guests to all performances. The only thing they have to do is simply communicating to this e-mail address the performance/s they are interested into and our Ticket Office will duly put at their disposal complimentary tickets as many as they desire." "Ceremony marking the occasion of Herbert von Karajan's 100th Anniversary"
"The lecture was a success: more that 2 hours, a lot of questions, amateur and professional musicians, people from 15 to 75 years"
A special "Karajan Issue" in which Peter Quantrill, Richard Osborne, Rob Cowan and Mirella Freni survey the life, the work, the man. The CD contains a rare 1967 interview with the great conductor, with music including his previously unheard Bach recording. 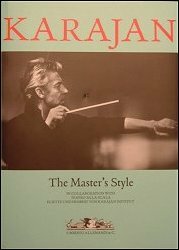 The Luxembourg based classical music magazine “Pizzicato” have published since January 2008 some 20 pages about “Karajan 2008” and he was featured on the front page of the April issue. 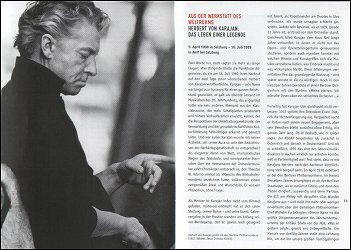 The Austrian motoring magazine will have an article about Karajan's cars in their April 2008 issue. 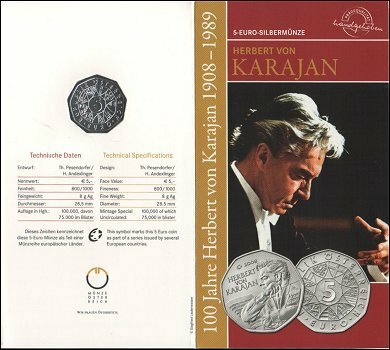 In response (dated January 2008) to my enquiry the Austrian Postal Authority says it is not planning any postage stamp issue or a special cancellation commemorating the 100th Birth Anniversary of Herbert von Karajan. 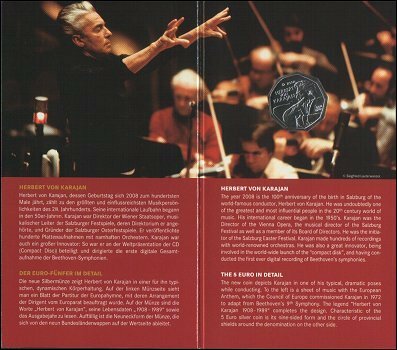 According to their preliminary 2008 programme (dated June 2007), Deutsche Post have no plans to issue a stamp commemorating the 100th Birth Anniversary of Herbert von Karajan. 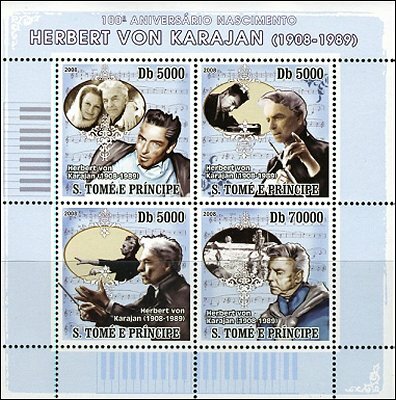 Miniature sheet of four stamps featuring images of Herbert von Karajan, conducting, with his wife and a space view. 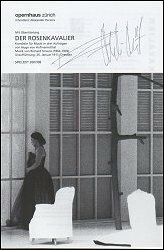 "Mein Leben an seiner Seite" (2 CD) Release January 2008 DG 477 754-1 Note: Eliette von Karajan's personal selection of favourite Karajan recordings. See her autobiography listed above. 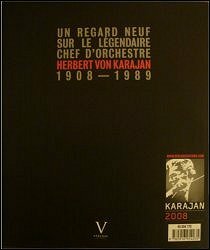 "Karajan Complete DG recordings" (240 CD) Release April 2008 UCCG90001 Note: Japanese issue only. 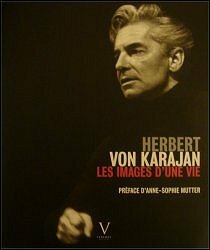 "Herbert von Karajan - Mensch und Mythos" ("Herbert von Karajan: Man and Myth: A Portrait in Seven Chapters") A 3-CD 170-minute audiobook - DG's first such - which is in effect a radio documentary of Karajan's life. Richard Osborne wrote the programme which is in seven chapters, with a narrator, interview inserts, and music inserts. Release March 2008 002894800365 (ISBN 978-3-8291-2108-3) Note: Unfortunately it is only available in a German language version. Note: First release on DVD but Japanese issue only. Note: I have been told that this DVD is now to be released on 17th December 2008. Note: Adam Professional Audio have announced that Sony are releasing 5.1 surround sound versions of the Karajan Legacy films. Instead of re-mastering the recordings they have played back the original stereo signal at the Berlin Philharmonie and the Vienna Musikverein then re-recorded it so as to capture the acoustics of the hall. Bach Violin Concerto No 2 B.P.O. Beethoven	Symphony No 1 B.P.O. Beethoven	Symphony No 2 B.P.O. Beethoven	Symphony No 3 B.P.O. Beethoven	Symphony No 4 B.P.O. Beethoven	Symphony No 5 B.P.O. Beethoven	Symphony No 6 B.P.O. Beethoven	Symphony No 7 B.P.O. Beethoven	Symphony No 8 B.P.O. Beethoven	Symphony No 9 B.P.O. 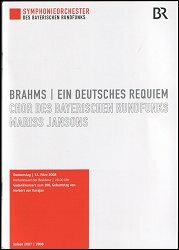 Brahms Ein deutsches Requiem V.P.O. Brahms	Symphony No 1	B.P.O. Brahms	Symphony No 2	B.P.O. 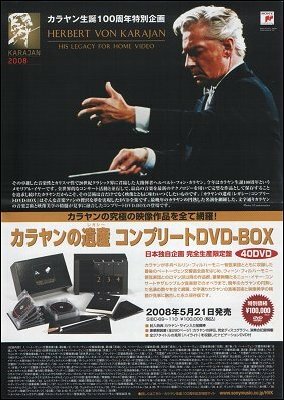 Bruckner Symphony No 8 V.P.O. Bruckner Symphony No 9 B.P.O. Debussy	Prelude a l'apres-midi d'un faune	B.P.O. Dvorak	Symphony No 8	V.P.O. Dvorak	Symphony No 9	V.P.O. Mussorgsky	Pictures at an Exhibition	B.P.O. Prokofiev Symphony No 1 B.P.O. Ravel	Daphnis et Chloe:Suite No 2	B.P.O. Rossini Guillaume Tell Overture B.P.O. Strauss [J Jnr] An der schonen blauen Donau V.P.O. Strauss [J Jnr] Annen-Polka V.P.O. Strauss [J Jnr] Der Zigeunerbaron Overture B.P.O. Strauss [J Jnr] Der Zigeunerbaron Overture V.P.O. 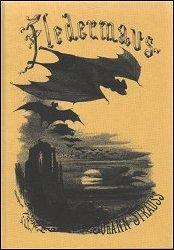 Strauss [J Jnr] Die Fledermaus Overture V.P.O. Strauss [J Jnr] Fruhlingsstimmen Waltz V.P.O. Strauss [J Jnr] Kaiserwalzer V.P.O. Strauss [J Jnr] Unter Donner und Blitz Polka V.P.O. Strauss [J Jnr] Vergnugungszug Polka V.P.O. Strauss [J Jnr & Josef] Pizzicato Polka V.P.O. Strauss [J Snr] Beliebte Annen-Polka V.P.O. Strauss [J Snr] Radetzky March V.P.O. Strauss [Josef] Delirien Waltz B.P.O. Strauss [Josef] Delirien Waltz V.P.O. Strauss [Josef] Ohne Sorgen Polka V.P.O. Strauss [Josef] Spharenklange Waltz V.P.O. Strauss [Richard]	Alpine Symphony	B.P.O. Strauss [Richard]	Also Sprach Zarathustra	B.P.O. Strauss [Richard]	Death & Transfiguration	B.P.O. 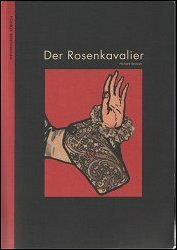 Strauss [Richard] Der Rosenkavalier V.P.O. Tchaikovsky Piano Concerto No 1 B.P.O. Tchaikovsky	Symphony No 4	V.P.O. Tchaikovsky	Symphony No 5	V.P.O. Tchaikovsky	Symphony No 6	V.P.O.